A mid-sized silver miner might produce 10m ounces annually, which is worth $149m at Q1’s average silver price. Yet a mid-sized gold miner producing 300k ounces a year can generate revenues 2.4x higher at $356m. These comparisons hold even with silver’s accelerating new bull so far in Q2’16, which has produced much-higher average silver prices of $16.64 quarter-to-date compared to $1255 for gold. Despite silver’s excellent 11.7% increase in average prices so far this quarter, that mid-sized silver miner would still only see yearly sales of $166m at these levels. That compares to $376m for that mid-sized gold miner, still 2.3x higher. The cash flows silver mining spins off at these low silver prices often aren’t sufficient to sustain mid-sized mining operations, so elite silver miners have been actively diversifying into gold. While mining more gold makes the silver miners much stronger financially, it also dilutes their exposure to silver which is the main reason investors buy their stocks. Unfortunately there are effectively no pure silver miners left anymore in the mid-tier and major ranks, and very few among the small but super-risky silver-mining startups. Silver miners’ increasing gold operations certainly complicates analyzing them. Their Q1’16 reports weren’t due out until 45 calendar days after quarter-end, and as usual these miners generally like to push that legal limit. So this is the first week where comprehensive Q1’16 operating and financial data across the silver-mining industry is available. I always like to dig into these quarterly reports to get a handle on how this industry is faring fundamentally, which helps me make investing decisions. I want to look at the elite silver miners’ results, the biggest and best companies out there with the most-widely-held stocks. And they are all owned by the overwhelmingly-dominant silver-stock ETF, which is the SIL Global X Silver Miners ETF. As of this week SIL had $286m in assets. That was a whopping 6.2x larger than its next-biggest competitor’s mere $46m, the SLVP iShares MSCI Global Silver Miners ETF. But since there aren’t that many silver miners out there, SIL also includes 9 of SLVP’s 10 holdings. As of the middle of this week, this flagship SIL silver-stock ETF had 21 holdings. SIL is the leading way for stock investors to invest in silver stocks today. 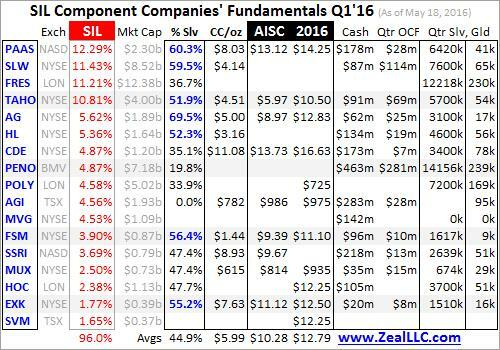 I painstakingly analyzed the top 17 of these component companies’ Q1’16 quarterly reports this week, which collectively accounted for 96.0% of SIL’s total weighting. 13 of these top silver miners as determined by SIL’s managers trade in the US and Canada, and 12 of them had published their quarterly results by the middle of this week. The lone straggler was Silvercorp Metals, which had its fiscal year-end on March 31st. Because full-year results must be fully audited by a CPA firm before filing, that final fiscal quarter’s deadline is extended to 90 days. So there’s no Q1 data yet. I dug through all available Q1’16 results from these elite top 17 components of SIL and fed a bunch of data into a spreadsheet for comparison. The table below highlights some of the most relevant. Any cell left blank means that particular company didn’t report that piece of data. Usually companies’ weightings in the top ETFs don’t change very much, so I was surprised to see a major reshuffling at the top of SIL. Because of that 90-day post-quarter-end filing deadline for quarterly results ending fiscal years, Q4’15 results of these elite silver miners couldn’t be analyzed until April. A few weeks ago I published an essay on silver miners’ operating results in that critical secular-trough quarter. Their actual performance in those miserable silver conditions was an important baseline from which to compare recovery quarters. Back in mid-April Tahoe Resources was SIL’s largest holding at 12.1% of this ETF’s weight, but by this week that had dropped to 10.8%. More interestingly Pan American Silver’s weighting rocketed from just 5.5% in mid-April to the pole position at 12.3% by this week! I can’t recall seeing a faster shift in a major ETF’s weighting of an elite company, and these ETFs’ managers almost never discuss their decision processes. I suspect this major shift was a gold thing. Tahoe Resources issued new guidance in early April after its acquisition of Lake Shore Gold was completed. It now expects to produce a midpoint of 400k ounces of gold this year along with the previously-forecast 19.5m ounces of silver. At prevailing prices near $1250 and $17, this yields gold revenues of $500m this year which are much higher than silver’s at $332m. Mighty Tahoe, which was spun off by Goldcorp to create a totally-pure primary silver miner operating one of the world’s largest silver mines in Guatemala, is now a primary gold producer. Unfortunately, silver revenues running around 40% of total sales for these elite silver miners are pretty common. I calculated the percentage of revenue that each elite SIL company actually generated from silver sales in Q1’16. The methodology to determine how pure these silver miners are is pretty basic. Their silver production in the first quarter was multiplied by silver’s average price, or a company’s actual average realized silver price in Q1 if they happened to report it. Then that result was divided by their total revenues. Since silver lagged gold’s initial big advance like usual in Q1, I figured that the SIL miners’ silver purity would drop. And that was indeed the case, as is evident in the fifth column below after each company’s symbol, the exchange its stock is traded on, its weighting in SIL, and its market capitalization. The average percent of sales generated by actual silver mining in Q1’16 fell to 44.9% from Q4’15’s 47.5%. As silver’s young new bull continues to outpace gold now that it is underway, I expect this percentage to start rising again. Silver prices generally rising faster than gold’s on balance should help offset these elite silver miners’ ongoing diversifications into gold mining. Rather interestingly, the ranks of true primary silver miners which generate over half their revenue from silver actually grew to 7 in Q1’16 from 6 in Q4’15. These majority-silver companies’ percentages are highlighted below in blue. Hecla Mining just joined this club. For investors logically buying silver stocks because they want leveraged exposure of silver-mining operating profits to silver’s upside, the greater the fraction of companies’ sales derived from silver the better. If a company generates less than a third of its cash flows from silver, I don’t think it should even be considered a silver miner. At that point silver is simply a byproduct within the total operations of that company. SIL’s managers ought to jettison the diversified mining conglomerates like Fresnillo, Industrias Penoles, and Polymetal no matter how much silver they produce. Their stock prices naturally don’t follow silver. SIL would be a radically-better investment for silver exposure, really the only reason investors buy it, if companies were only included that generate over 40% of their sales on a trailing-twelve-month basis from silver. This rest of the columns in this table focus on the operating fundamentals for the elite silver miners of SIL. This includes Q1’16’s cash costs per ounce produced, all-in sustaining costs per ounce, and AISC guidance for full-year 2016. After that is cash on hand at the end of Q1, cash generated from operations in Q1, and finally each company’s actual Q1 silver and gold production. These silver miners all mine gold too. Collectively these top 17 SIL silver miners produced 74.5m ounces of silver in Q1. With global silver mine production now running about 221.7m ounces a quarter per that latest Silver Institute report on silver’s fundamentals, these major silver miners account for about 34% of world production. But take out those 3 non-silver-centric conglomerates, and that drops to 41.0m or around 18%. Primary silver miners are rare. Back in Q4’15, many investors questioned the very viability of this industry. By mid-December just days before the Fed’s first rate hike in 9.5 years, silver slumped to a brutal 6.4-year secular low of $13.69. But as the silver miners’ actual Q4’15 operating results later proved, that was never a threat. Q4’15’s average cash costs for the elite silver miners of SIL were just $6.68 per ounce, far below even silver’s deep lows. Cash costs are the acid-test measure of what silver price the miners need to break even and cover their ongoing cash operating expenses. These include all direct production costs, mine-level administration, smelting, refining, transport, regulatory, royalty, and tax expenses. Silver miners can survive as long as silver prices remain above their cash costs. And in Q1’16, average cash costs fell 10.3% to just $5.99 per ounce! A big factor in this was the surging gold prices, which resulted in higher byproduct credits to offset silver-mining expenses. It’s pretty impressive to see cash costs drop so dramatically in a quarter where silver’s average price edged just 0.9% higher to $14.90. As long as silver remains above $6, which is impossibly low given its fundamentals today, any talk of silver miners might not being able to survive is foolish. All-in sustaining costs include everything necessary to maintain and replenish silver-mining operations at current production levels. This includes all direct cash costs of mining silver, along with all corporate-level administration that always should’ve been included in cash costs. But AISC go far beyond that to encompass the entire mining cycle, making them a far-more-realistic representation of true silver-mining costs. They also include exploration for new silver to mine, the enormous mine-development and construction expenses necessary to bring new mines online, remediation, and reclamation. As long as prevailing silver prices remain above all-in sustaining costs, silver miners can continue to produce at current levels indefinitely. And rather impressively they plunged dramatically in Q1’16 among the elite SIL silver miners. Their average AISC of just $10.28 per ounce were 21.8% lower than Q4’15’s $13.14! That’s amazing, leading to soaring operating profits for these elite silver miners in Q1’16. In the fourth quarter, silver’s $14.77 average less the $13.14 AISC average drove silver-mining operating margins of just $1.63 per ounce. That’s tight, too low for comfort for an industry that has to contend with silver’s wild price volatility. But in the first quarter, $14.90 average silver less those much-lower $10.28 AISC led to vastly healthier operating margins of $4.62 per ounce! That was a mind-boggling 183% higher! This revelation ought to be the final nail in the coffin for the idea that silver stocks’ enormous gains so far this year haven’t been fundamentally justified. Just the opposite is true, soaring operating profits righteously supported soaring stock prices. Unfortunately the silver miners themselves don’t expect Q1’16’s low AISC to persist, as their average AISC projection for all of 2016 is much higher at $12.79. But I suspect this year’s actual AISC will come in much lower than those forecasts. The silver miners made their 2016 guidances way back in early January before gold and silver started powering higher. So those projections assumed very-low prices all year. A great example is First Majestic Silver, the purest major silver miner in the world today with 69.5% of its first-quarter revenue from silver. It forecast its full-year-2016 guidance for AISC back in mid-January, and assumed silver and gold averaging just $14 and $1000 this year! As gold’s new bull continues to power higher, rising byproduct credits for gold will lower silver-mining costs far more than widely anticipated. In addition back in January when 2016 outlooks were calculated, investors remained very worried about this industry’s survivability so they were overwhelmingly focused on costs. The management teams at the silver miners have big incentives to overestimate cost projections to ensure they can beat them later. So actual AISC in 2016 are likely to be considerably less than the conservative inflated estimates published. But even if this industry really does have AISC up near $13, the potential growth in operating profits as silver inevitably mean reverts higher is still massive. Remember that silver prices like 2015’s were a total anomaly driven by the Fed’s stock-market levitation crushing demand for alternative investments led by gold and silver. Silver’s average prices in 2014, 2013, and 2012 were way up at $19.05, $23.80, and $31.19. So even at $12.79 AISC for this industry, the potential operating profits soar to $6.26, $11.01, and $18.40 per ounce as silver mean reverts back to normal levels from recent years as gross market distortions from the Fed’s machinations gradually unwind. Those represent profits growth of 36%, 138%, and 298% even at much-higher AISC on mere 28%, 60%, and 109% uplegs in silver from Q1’16’s average price level! Naturally Q1’16’s surging operating profits for silver mining fed strong operating cash flows for most of these elite silver miners, helping maintain hefty cash treasuries even after Q1’s positive silver-price action encouraged these companies to start spending on expansion again. The silver miners continued to generate impressive cash flows from operations even while silver’s average price stayed near Q4’15’s trough. So even though silver didn’t do much in the first quarter as its new bull market lagged gold’s, the silver miners’ fundamentals improved considerably. Higher gold prices generated higher byproduct credits for the elite silver miners, lowering their costs. And that trend is going to continue. At a $1255 average so far in the second quarter, gold is up another 5.9% at this point. So silver-mining costs should keep falling. On top of that, silver’s average price so far this quarter at $16.64 is a huge 11.7% higher than its average level in the first quarter. Much-higher prevailing selling prices combined with costs still trending lower should make for amazing silver-mining profitability in Q2’16. We won’t know for sure until 3 months from this week when those operating results are fully filed, but the outlook is very bullish halfway through Q2. So silver miners’ upside from here remains vast, in terms of both profits and stock prices. Investors can take advantage of any silver weakness to buy aggressively, as this young mean-reversion silver bull is likely to run for years. The coming massive gains in silver stocks can certainly be ridden through this leading SIL ETF, which indeed contains the world’s biggest and best silver miners. But SIL has problems. SIL’s managers have really diluted their ETF’s upside to silver by including those mining conglomerates that derive the great majority of their revenues from metals other than silver. And though SIL’s holdings have to be generally weighted by market capitalization, it takes much bigger capital inflows to boost a larger silver miner than a smaller one. And the biggest silver miners are increasingly diversifying with gold. So SIL’s silver-bull-market performance is going to seriously lag that of the best of the elite silver miners. An expertly-handpicked portfolio only including the companies with superior fundamentals leveraged to silver is going to trounce the silver-stock ETFs’ gains. So investors willing to do their homework and buy individual stocks instead of settling with the leading silver-stock ETFs are going to enjoy big outperformance. Deep individual-stock research has long been one of our specialties at Zeal. We’ve spent over 16 years now intensely studying and actively trading this high-potential precious-metals-stock sector. This has fueled many hundreds of gold-stock and silver-stock trades over the years helping our subscribers multiply their wealth. As of this week, one of our new silver-stock trades had soared 381% since mid-January alone! While you don’t have time to invest tens of thousands of hours to understand the markets, you can put us to work for you. We’ve long published acclaimed weekly and monthly newsletters for contrarians. They draw on our vast experience, knowledge, wisdom, and ongoing research to explain what’s going on in the markets, why, and how to trade them with specific stocks. They will help you learn to think, trade, and thrive like a contrarian for just $10 an issue. Subscribe today while silver’s new bull remains young! The bottom line is the world’s elite major silver miners enjoyed a very strong first quarter in fundamental terms. Even while silver continued to languish near secular lows, silver-mining costs fell sharply as gold rallied and boosted byproduct credits. This led to massive growth in silver-mining operating profits in Q1’16, more than justifying the powerful surges the silver-mining stocks have enjoyed in recent months.